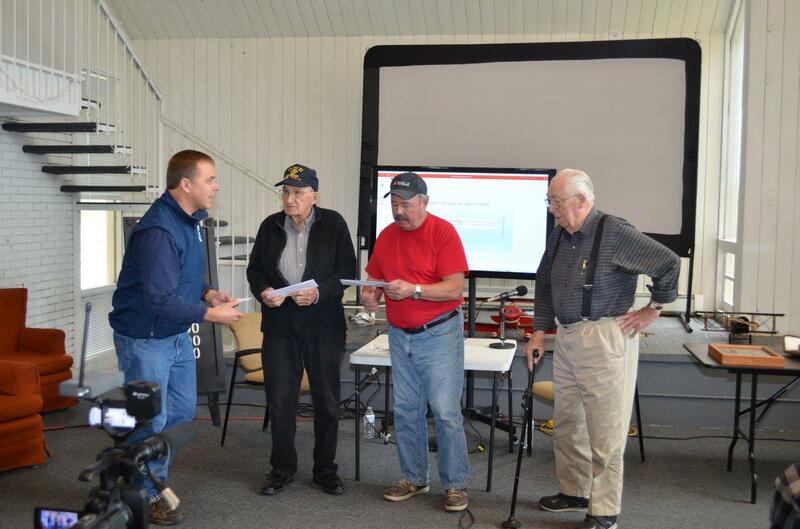 While this Veteran’s Day may not have been a perfect day to fly, inside the Galt Airport Studio building, it was a great day to hear three veterans tell their stories! 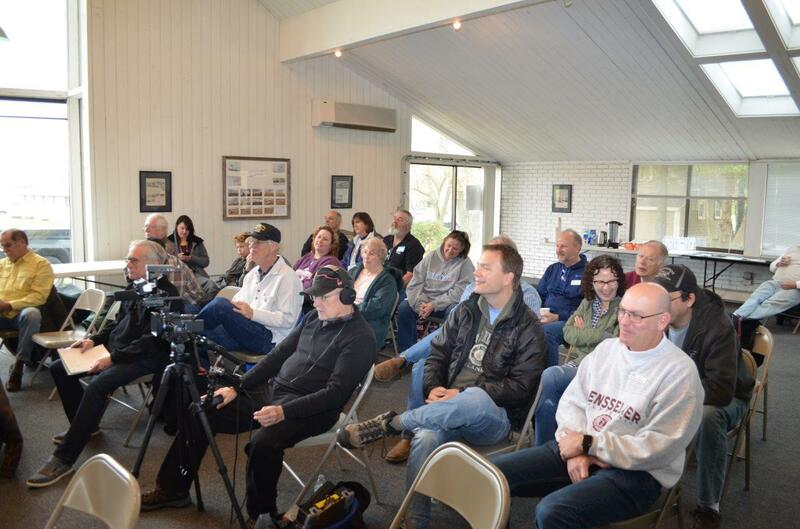 After an opening welcome to the Veteran’s Day gathering, EAA Chapter 932’s President, Arnie Quast, introduced Parker Johnston, who was there to host two interview sessions for his “Aviation Life” radio program in front of a live audience of members and guests. 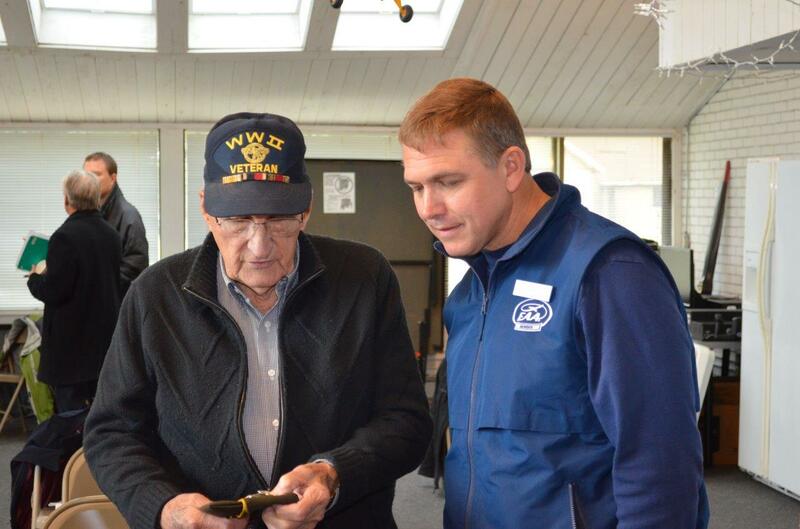 The first guest, 95-year-old Harold White, delighted us with his memories as a B17 waist gunner during WWII. Entering the Army Air Corps in July of 1940, Harold began his primary flight training in Stearmans, only to learn that his eyesight was going to keep him from becoming a pilot. It was decided that he did, however, have good enough vision to become a gunner. Sent to Italy as a crew member on board a B17, Harold quickly realized that he was a better waist gunner than turret gunner when the constant movement within a ball turret gave him severe motion sickness. During one run, his bomber was badly damaged by flak. The crew members rushed to keep the aircraft flying, using parachute cords to secure the failing tail structure to the plane. When the crippled B17 was finally stabilized, they realized that they no longer had any way to bail out! Fortunately, the beat-up bomber held together long enough to make it back to their base. Harold White flew 50 missions in Europe before he was discharged. 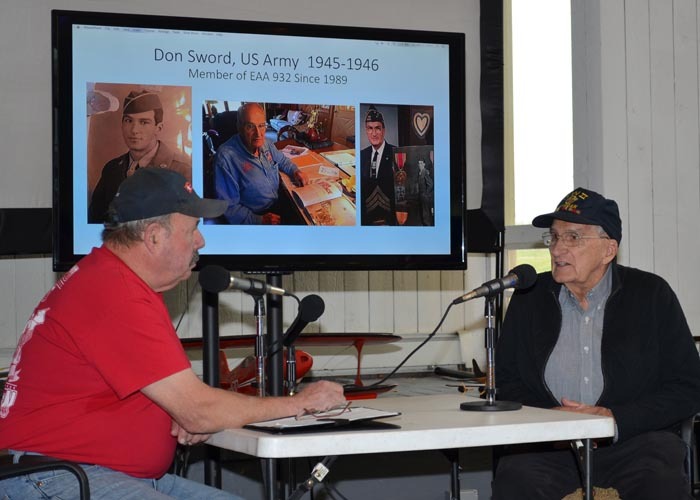 Parker’s second guest interview was our own long-time chapter member, 90-year-old, Don Sword. 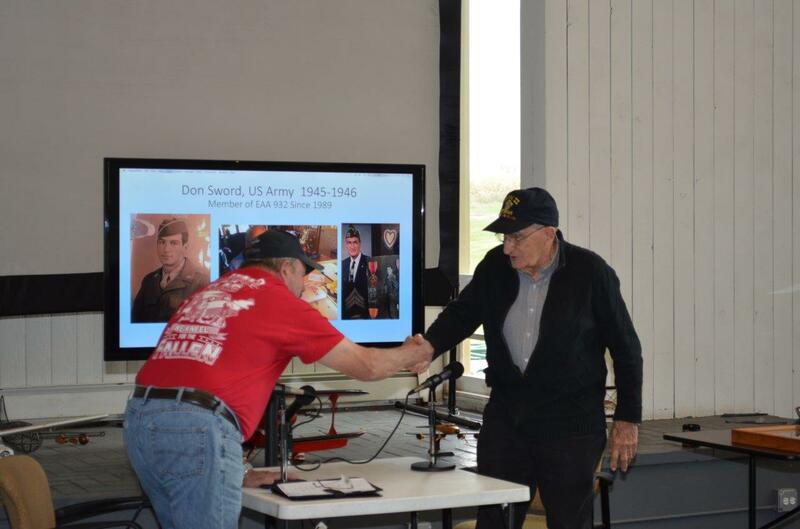 Growing up in southeastern Ohio and never having traveled more than 100 miles from home, Don found himself drafted into the army in 1944. He received basic training in Florida, expecting to serve in the Pacific theater, since the European war had come to an end. Don’s advanced training was cut short when he and 6,000 other men were ordered to board a troop ship headed for Okinawa. When the atomic bomb was dropped on Japan and the armistice was signed, his ship was was redirected to Korea. At that point, the military found itself doing more policing than fighting, so Don was assigned to duty as an MP, working out of the equivalent of a Korean police station. By the end of 1946, Don was discharged and used the GI Bill to attend a trade school and to get his pilot’s license. His flight training was at Huffman Prairie outside of Dayton, Ohio, the same field where the Wright Brothers had tested their airplane designs in 1905. 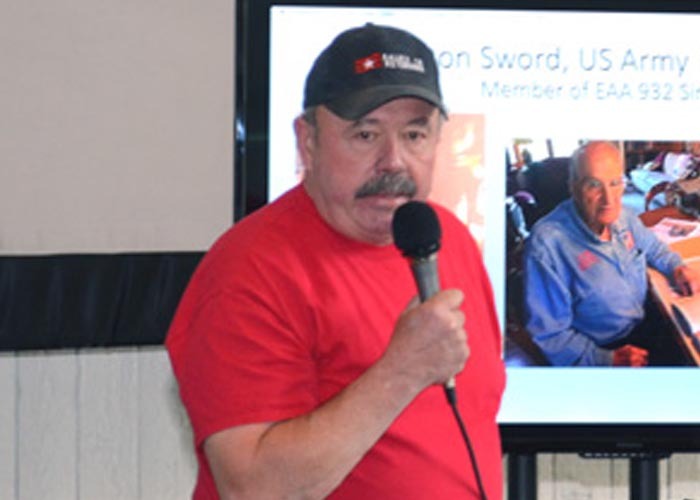 After completing the interviews with our WWII veterans, Parker stood and spoke to the audience about his experiences during the height of the Viet Nam War during the late ‘60s. He recalled being lined up at the induction center and having every fourth draftee assigned to the Marine Corps. Sent off to Texas to train in tank warfare, Parker recalled “a sharp lookin’ paratrooper” coming up and telling the trainees that he’d give a week’s leave to anyone who volunteered to become paratroopers. Not wanting to miss an opportunity to get out of the tanks, Parker headed off to jump school at Ft. Benning, GA. Once again, an officer showed up asking if anybody would like to learn how to rig parachutes. He too, offered a week’s leave, and Parker went off to Ft. Lee, VA to learn how to pack parachutes. Eventually assigned to the Special Warfare Group at Ft. Bragg, NC, Parker ended up tested new parachutes and helping to develop low-altitude delivery systems for the Army. He and a photographer frequently followed a test dummy out of the plane to document the new systems. Parker said that if the Army or Air Force had a plane that they could drop anything out of, he has jumped from it. As he ended his story, two of Parker’s grandchildren came forward carrying a rolled-up, paper banner and presented him with a handcrafted tribute. 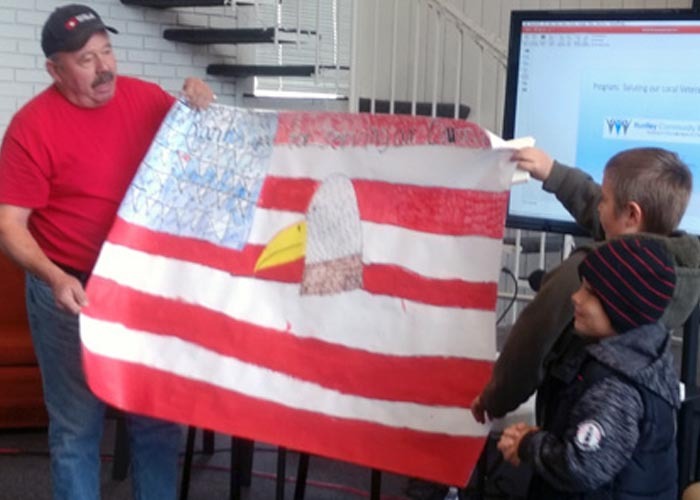 On it was their drawing of a large American flag with an eagle centered on it.